Dave and I have been building our house for a decade. Dave has done as much of the work himself as he possibly can, when he has the time. In December he decided to start working on the wooden floor in our study. We did the flooring for our cottage bedroom ourselves and it was really hard work. And it was a great learning curve. Since then we have discovered you do not need as many nails as we used in the cottage, and you can hide the nails in the tongue of the flooring. Our study and walkway are about 50m². Dave bought 20m² of pine tongue and groove flooring and the installation went easier and quicker than he thought. The floor will be sanded once done, and sealed. When we did the cottage floor our roofing contractor had put us behind schedule and so we did not have time to sand and seal that floor. Now, the reason I am telling you this is because I needed to photograph my blueberry vinegar. We don’t yet have the blinds in the house, and the sunlight was affecting my photographs. So I put the vinegar on the newly laid floor and it spilt! It was only a small drop, but I nearly cried. Thankfully I managed to clear up the beautiful purple stain and you cannot see it. The sunlight was still too bright so I moved the vinegar and my infinity table into our cottage bedroom. And lo and behold I managed to spill a huge amount of the blueberry vinegar. Our old wooden floor has a massive purple stain which hopefully will come out when the floor is eventually sanded down. I am so grateful now that it has not yet been done. But, that still left me without a decent photograph. I tried making a ‘light’ box out of an old shoe box, but it was now too dark. Even though I did not manage the best ever photograph of my vinegar, I can tell you it has the most amazing blueberry taste, and of course, the most amazing purple colour! This stunning colour vinegar packs a punch of flavour! This is such a simple thing to make, great idea and I bet it tastes lovely. 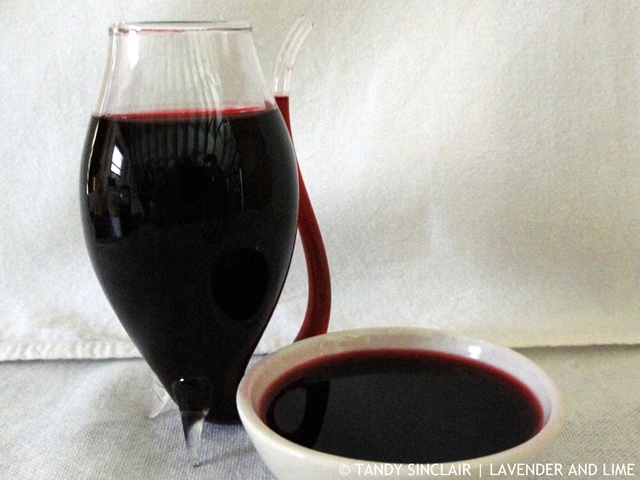 I love the idea of making blueberry vinegar. So sorry about your floor. But at least you got it up quick. That would be sad, especially when you are doing all the hard work youself. Nice photos. Oh NOOOOOO!!!!! Tandy that’s just not fair!!! Things we do for a photo hey 🙂 My phone (my only camera) was dropped and it’s taking a terrible photo now 🙁 so I have to work on it even more!! It’s almost putting me off using it, almost. This vinegar looks amazing though!! Oh wow Tandy, I love this. I have to give this recipe a try very soon. Amazing post. Ouch Tandy! I heart sank everytime you mentioned the word “spill”! My husband and I have just moved into a new rented apartment, and boy, setting up the place has been a pain. Even the tiniest setback sends me into tears. On another note, your post highlights the efforts we take for clicking the right pictures. Blogging isn’t the cakewalk many people assume it is! The vinegar does look gorgeous, though! The things we do for a good photograph, eh!? Your home build sounds exciting, Tandy… and I love your fruit vinegar recipe. I’ve never thought to make my own vinegar. Great idea! I never knew making infused vinegars was so easy!! I bet this would be great in salad dressings. Looks fab – Tandy – I know what it’s like photographing under difficult conditions – most of mine in the last year has been on top of a freezer on a placemat!